Summary: Blushing Books is proud to present our first compendium of Real-Life stories from a series of authors such as Starla Kaye, Loki Renard, Joannie Kay, Korey Mae Johnson, and many more! The authors in “Attitudes” are a mix of professionals, who’ve been writing for Blushing Books long before there WAS a Blushing Books (when we were still just plain old Bethany’s Woodshed), and total newcomers, folks who have never written anything for public consumption before. What these stories have in common is that every one of them – as far as we can determine – are true. In fact, several of the emails that I received accompanying these submissions started with the same phrase: Unfortunately, this is a true story. Some are humorous. My own “The Problem with Smoke Detectors,” when it was released, was called by several readers “the funniest thing I have ever read.” While I don’t think it’s quite THAT good (and I sure wasn’t laughing when it happened!) I must admit that now it is good for a chuckle or two. Ditto Incorrigible Cori’s “Spanking is No Game.” How can you not laugh out loud at the image of our poor heroine chucking toilet paper rolls at her boss from the safety of the store’s loft – a refuge that unfortunately didn’t last that long. Others are more serious, like Korey Mae Johnson’s Paying the Toll, and discuss how spanking really works in genuine DD (Domestic Discipline) relationships. And we have the unique perspective from the Johnsons, because Korey’s real-life husband James has provided two stories as well. Some feature couples where both members are avowed “spankophiles.” Korey met James on a spanking forum; my Jim and I also met through the spanking community. Yet others, like Loki and her “vanilla” partner, did not originally share the spanko bug. Yet, when you read “My Vanilla Spanker,” it’s hard not to say to yourself: Well, he managed to figure THAT out! 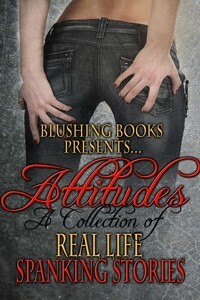 We hope you enjoy Attitudes, and will visit both Blushing Books, and Bethany’s Woodshed. Our professional authors – Starla Kaye, Loki Renard, Korey Mae Johnson, and Joannie Kay – have many wonderful stories for you. And some of the new names in this book? Who knows what they might offer us in the future. Summary: When Edward Grimm awoke Christmas morning to find a beautiful young girl asleep on his couch, he knew his first ever year off the naughty list hadn’t been in vain. 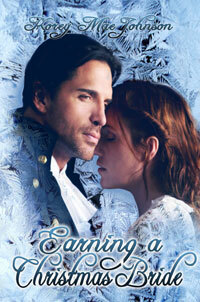 Her presence meant that last Christmas hadn’t been a dream, and that his life hadn’t changed for nothing. It meant he had another chance. Last year, Faith Claus had done the unthinkable: she had snuck onto her father’s sleigh and visited the human city of London. She hadn’t gotten far that night—she fell right off a rooftop and onto the head of Edward Grimm: London’s most lecherous, womanizing bachelor. After the most magical night Edward had ever spent with his clothes on, he had awoken to find her gone, and she had been hauled back to the North Pole for a strict chastisement from her loving father, Santa Clause. A year later, and with a whole lot of help, she found herself back in England, and back with Edward–but the only way Edward can keep her is if he proves himself worthy. But can a rogue like himself ever earn his bride? And if he could, could he tame her? Jack always had a soft spot for Jo, which only got worse when she came back her freshman year in college. When he saw her then, she was no longer some ‘sister’-type. She was gorgeous and spell-binding. Too bad she hated his guts. Finally, these fate-bound lovers get snowed in together for Christmas–will they get what they always wanted, or will their love for each other continue to be unrequited because of their stubbornness?